I always put another cozy hoodie sweatshirt on my list. I've seen a few around Facebook as sponsored posts lately, but I couldn't find any of those when I went searching tonight. LOL I need to start writing this stuff down as I go! 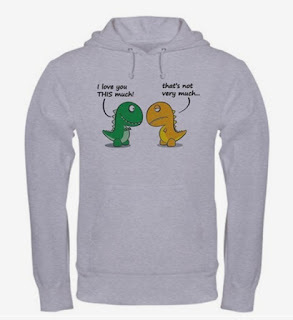 But I always love a good t rex joke. So this sweatshirt from Cafe Press is right up my alley. Grey or any other color is better than white for me, but this one had dark text that of course wouldn't show up on black or navy - so the grey one in a size medium is totally where it's at. Cute :) a comfy sweatshirt is essential for winter in Michigan, lol. So cute! I actually laughed out loud when I enlarged the photo to read the shirt.